One of the issues I've touched on in the Longfellow Bridge series is the fact that there as no bicycle count done at peak use times—inbound in the morning. The state's report from 2011 (PDF) counted bicyclists in the evening, and shows only about 100 cyclists crossing the bridge in two hours. Anecdotally, I know it's way more than that. At peak times, when 10 to 20 cyclists jam up the bike lane at each light cycle, it means that 250 to 500 or more cyclists are crossing the bridge each hour. So these numbers, and bridge plans based on them, make me angry. But instead of getting mad, I got even. I did my own guerrilla traffic count. On Wednesday morning, when it was about 60 degrees and sunny, I went out with a computer, six hours of battery life and an Excel spreadsheet and started entering data. 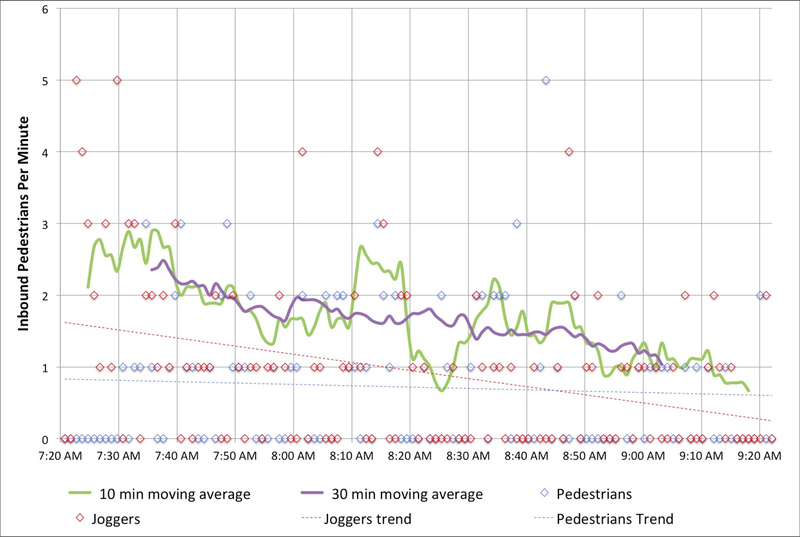 For every vehicle or person—bike, train, pedestrian and car—I typed a key, created a timestamp, and got 2250 data points from 7:20 to 9:20 a.m. Why 7:20 to 9:20? Because I got there at 7:20 and wanted two hours of data. Pay me to do this and you'll get less arbitrary times. But I think it's good data! First of all, the bikes. In two hours of counting, I counted 463 bicyclists crossing the Longfellow Bridge. That's right, counting just inbound bicyclists, I saw more cyclists cross the Longfellow in one direction than any MassDOT survey saw in both directions. The peak single hour for cyclists was from 8:12 to 9:12, during which time 267 cyclists crossed the bridge—an average of one every 13.4 seconds. So, yes, cyclists have been undercounted in official counts. Are we Market Street in San Francisco? Not yet. Of course, Market Street—also with transit in the center—is closed to cars. [Edit: Market Street is partially closed to private vehicles, with plans being discussed for further closures.] And at the bottom of a hill, it's a catchment zone for pretty much everyone coming out of the heights. They measured 1000 bikes in an hour (with a digital sensor, wow! 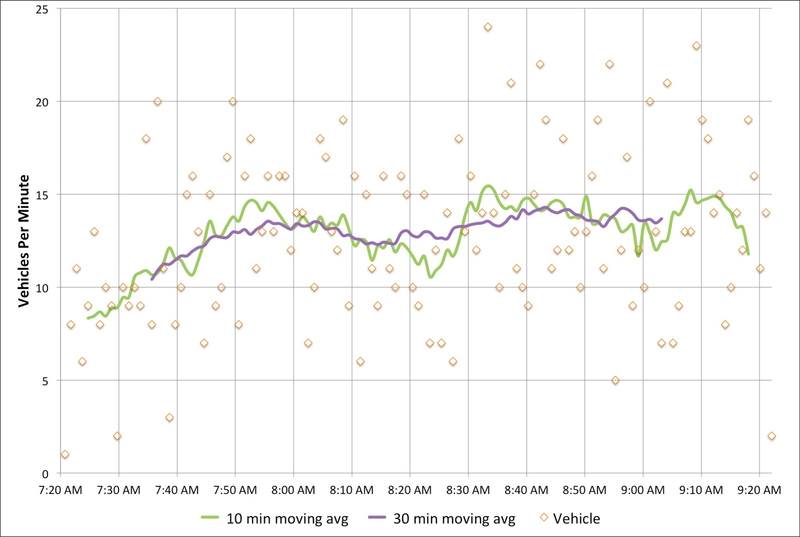 ), but that was on Bike to Work Day; recent data show somewhat fewer cyclists (but still a lot). I also counted vehicles (1555 over two hours; 700 to 800 per hour, including three State Troopers and one VW with ribbons attached that passed by twice), inbound pedestrians (about 100, evenly split between joggers and walkers, although there were more joggers early on; I guess people had to get home, shower and go to work) and even inbound Red Line trains (30, with an average headway of 4:10 and a standard deviation of 1:50). I didn't count outbound pedestrians, or the exact number of people I saw stopping to take pictures (at least three on my little nook of the bridge). First, bikes. Cyclists crossing the bridge started out somewhat slow—the moving average for the first 20 minutes was only one or two per minute. But the number of cyclists peaks around 8:40—people going in to the city for a 9:00 start—before tapering off after 9. 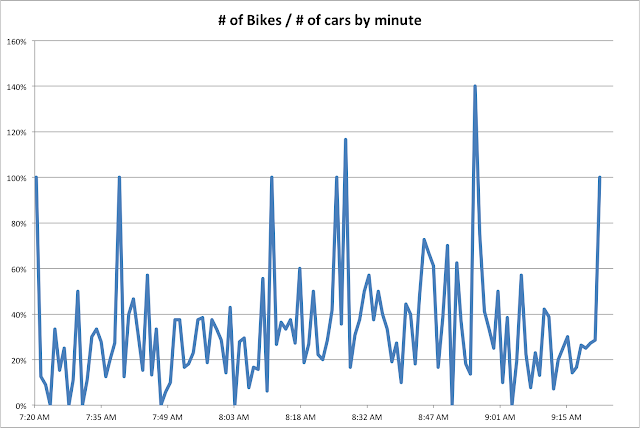 I've written before about seeing up to 18 people in line at Charles Circle which is backed up by these data; the highest single minute saw 11 cyclists, and there were four consecutive minutes during which 36 bikes passed. At nearly 6 bikes per minute for the highest half hour, it equates to nearly 360 bikes per hour—or 10 per 100 second light cycle. Too bad we're all squeezed in to that one little lane. (Oh, here's a proposal to fix that.) If anything, these numbers might be low—the roads were still damp from the overnight rain early this morning. 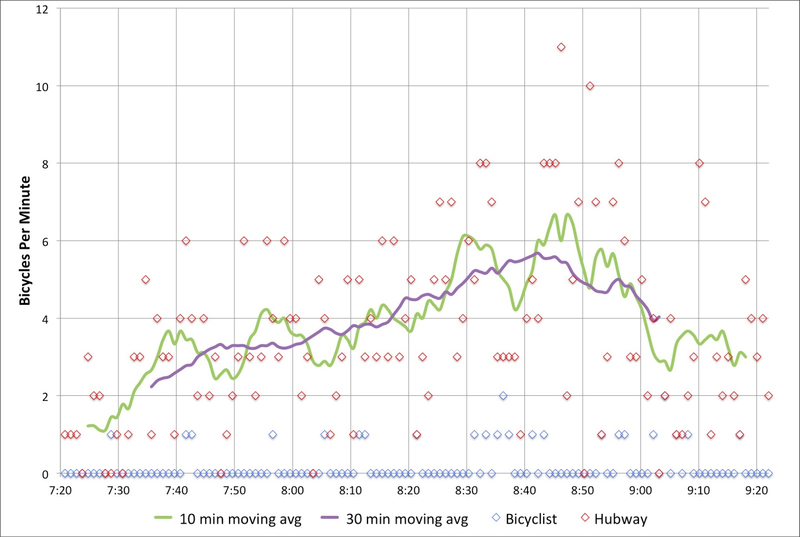 What was interesting is how few Hubway bikes made it across the bridge—only 25, or about 6% of the total. With stations in Cambridge and Somerville, it seems like there is a large untapped market for Hubway commuters to come across the bridge. There are certainly enough bikes in Kendall for a small army to take in to town. Next, cars. The official Longfellow traffic counts show about 700 cars per hour, which is right about what my data show. What's interesting is that there are two peaks. One is right around 8:00, and a second is between 8:30 and 9:00. I wonder if this would smooth out over time, or if there is a pronounced difference in the vehicular use of the bridge during these times. In any case, 700 vehicles per minute is not enough that it would fill two lanes even to the top of the bridge, so the second lane—at this time of day, anyway—is not necessary on the Cambridge side. I also tracked foot traffic. I did my best to discern joggers and runners from commuters. Joggers started out strong early, but dwindled in number, while commuters—in ties and with backpacks and briefcases—came by about once every minute. I was only counting inbound pedestrians, and there were assuredly more going out to Kendall. Additionally, I was on the subpar, very-narrow sidewalked side; the downstream sidewalk is twice the width (although both will be widened as part of the bridge reconstruction). And I counted when the trains came by. In the time that 2500 bikes, pedestrians and cars crossed the bridge, 30 trains also did. Of course, these were each carrying 500 to 1200 people, so they probably accounted for 25,000 people across the bridge, ten times what the rest of the bridge carried. Efficiency! The train times are interesting. The average headway is 4:10, with a standard deviation of 1:58. 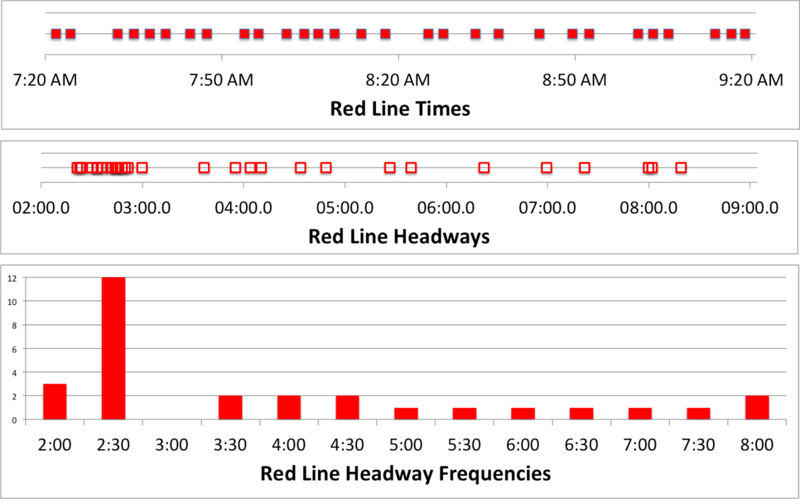 However, about half of the headways are clustered between 2 and 3 minutes. That's good! The problem is that the rest are spread out, anywhere from 3:30 to 8:30! Sixteen trains came between 7:20 and 8:20, but only 14 during the busier 8:20 to 9:20 timeframe. I wonder if this is due to crowding, or just due to poor dispatch—or a combination of both. In any case, what Red Line commuter hasn't inexplicably sat on a stationary train climbing the Longfellow out of Kendall? Well, after watching for two hours, I have an answer for why this happens! It is—uh—I was lying. I have no idea. But I say no fewer than a half dozen trains sit at that signal—and not only when there was a train just ahead—for a few seconds or even a couple infuriating minutes. I was glad I wasn't aboard. Finally, we can compare the number of bikes as a percentage of the number of cars crossing the bridge each minute. Overall, there were 30% as many bikes as cars. But seven minutes out of the two hours, there were more bikes across the bridge than vehicles. Cars—due to the traffic lights—tend to come in waves, so there's more volatility. Although bikes travel in packs, too. Anyway, this doesn't tell us much, it's just a bunch of lines. But it's fun. The state's report may have been accurate at the time in 2011. But I think the state's report is already out of date. I have been taking the Longfellow bridge to work by bike for about two years so far. There are definitely a lot more bikes this year compared to last year. 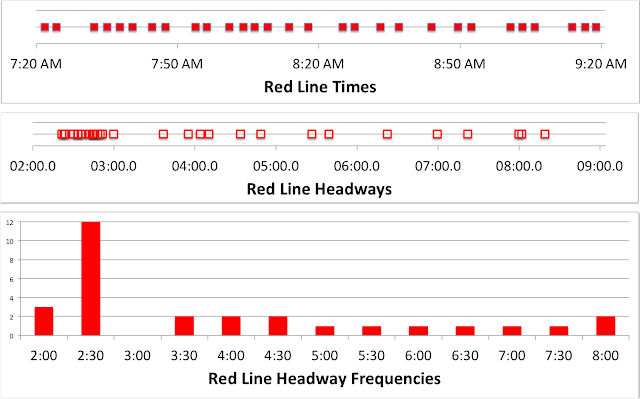 The Red Line should have an average headway, as scheduled, of 4 minutes 30 seconds at rush hour each way on the Longfellow bridge. The state's report may well have been accurate. However, by not doing a count during inbound morning peak, they missed the highest use time. And don't get me started on how the National Bike/Ped count is doing a bike/ped count on JULY 4 WEEKEND. For serious. http://bikepeddocumentation.org/. Market Street is not closed to Cars... BTW. It should be, but not yet. @Anon, will edit. Market Street is partially closed to private automobiles. @cdptrans, I try. I just went to a presentation from Peter Koonce about how "Level of Service" and other planning mumbojumbo is arcane, and the way traffic counts are done—with paper, pencil and poor choices of time frames—seem to be similar. The Boston Region Metropolitan Planning Office (MPO) plans to conduct a bicycle count July 4, 5 & 6 (http://www.ctps.org/Drupal/node/2201). That's a holiday, a weekend day, and a day sandwiched in between (a day I for one am taking July 5th as a vacation day to make a 4 day weekend... no doubt, many others will as well). The MPO cites the choice of dates is based on a recommendation from the "National Bicycle and Pedestrian Documentation Project (NBPD)" (http://bikepeddocumentation.org/). The Boston Region MPO's solicitation for volunteers (http://www.ctps.org/drupal/data/pdf/programs/livability/Volunteer_memo_July_2013.pdf) implies that they're looking for a count of commuters and a count of recreational traffic, saying the count should include peak commuting times on two week days (Thursday and Friday). This confuses me, as I'm sure the Boston Regional MPO realizes the 4th is a holiday. Some explanation can be found in the NBPD instructions brochure (http://bikepeddocumentation.org/index.php/download_file/-/view/16): "The 4th of July period was selected because it will afford both a typical summer weekday and what is typically the busiest holiday period and activity period for recreational facilities and activities." Looking at the data from the Boston Region MPO bicycle/pedestrian count database (http://www.ctps.org/apps/bike_ped3/bike_ped_query.html) which has count data from 1976 up through 2012, there has never been a count conducted on July 4th. There has never been a count on July 5th, and counting on July 3rd has only happened once (in 2012). So here's what I'm afraid of. Most of the July data collected from 1976 through 2012 were not influenced by the holiday. Then you have 2012, where the count was taken on a holiday eve, and this year when counts are planned on the holiday itself, the "sandwich" day after, and the weekend day after that. I can imagine seeing a trend line of bicycle counts in July through the years with an upward slope, then it dips in 2012 (holiday eve) and plummets in 2013 (holiday day). I sure hope somebody in the Boston Region MPO takes this into account when they make infrastructure planning decisions based on these counts. ***Note*** that since Independence Day can be celebrated on July 3rd or 5th if the 4th falls on a weekend, I have adjusted my discussion to account for these variations. @Anon, for the love of Jehovah, please do not get me started on the MPO bike count. Next Friday will be a typical commute day? Anyone want to do a survey of people and see how many are planning to go in to work on Friday? And July 4 may be a typical holiday in some parts, but are we going to get any good data from anywhere near the Esplanade, with the whole of the thing shut down most of the day? These are obviously rhetorical questions, and the answer is, obviously, of course not. They're not doing typical summer traffic counts on July 5. They shouldn't do them for bikes, either. And if you wonder why I went out and did my own count, well, this.